Arrowed this nice ten point in Churchville, NY in Monroe County. He came in pretty hard to a "can call" and some grunts. He walked up the trail straight to me coming broadside at 15 yards. I was not sure that I would get to draw as he looked up at me twice, but my Skyline camo kept me in the clear. I drew, found my pin behind his shoulder, and let the Bowtech eat. I immediately saw blood on the entry wound as he ran away. I was able to watch as he started to walk and expected him to tip over in sight. So much for expectations. So I gave him twenty minutes before I got down to check my arrow and hit site. I found my arrow and good blood right away so I slowly started tracking him. As I got to the last spot that I could see him from the stand it looked like someone had turned on a spigot, I could see the blood trail for 30 yards ahead. Again, I expected to find him piled up any second. As I followed up the blood trail I looked up and saw him, it looked like he died leaning against a tree. I checked him out through my Nikons and unexpectedly he was still alive! Obviously he is very sick. I tried to get another arrow in him, but hit an unseen branch which shattered the Carbon Express with a sound like a gunshot. He got up and laid right back down five yards away. Oh boy! I backed out as quietly as I could. With the amount of blood, and how sick he looked and acted (tongue hanging out not wanting to move), I figured two hours should be good. So two hours later my buddy Gene, his 13 year old son Cam, and my friend Jim all went back to collect the buck. We started at the shot site to let Cam get practice following a blood trail and he did a great job following right up to where I had stopped last time. I decided to glass for the buck.. and there he was... sitting, staring at us still not wanting to get up, but very much alive...so much for figuring...arrrgh. We decide that one of us would move off and I would try to get a little closer to get another arrow in him, but he had none of that.. up he went and away. So, out we went. It is only about noon so I figure it was best to wait until the following morning as I did not want to push him into the cattails. I hoped (no figuring this time) that he would lay right back down and die. That evening I called Deer Search preparing for the worst. I did not know if that last bump had sent him on a long mad dash or if coyotes might bump him later on. I received a call back from Bob Yax at Deer Search Finger Lakes. After an informative discussion with Bob we agreed to meet Monday at 8 am. As planned I met Bob and Thor, his dog, and we were off. Thor easily tracked the initial trail as well as the second bump and as we headed down the track I looked up and low and behold, my buck! Sure enough he had only gone about another 100 yards or less, laid down and died. I was very relieved and happy. It was a very cold night and the coyotes had not found him so not only was I very happy to recover the trophy, he is going to make a lot of sausage and other sundry yummys. And now for the interesting part. It turns out what we had discussed as most likely being a liver shot was not.. there's that figuring thing again. I hit low on one lung (though I saw no bubbles or pink blood, it was all dark red) and I hit the heart! One blade made a slice through the thick part of the muscle of the heart and exited low chest. The first blood trail, like I said, looked like a faucet had been turned on. The second trail there was some blood but not much. When I dressed him the chest cavity seemed to have a five gallon bucket full. I think that the second run finished him off pretty quickly as when we found him his wet legs were frozen together and all of the fat in him was hardened. That made for a very easy field dressing. 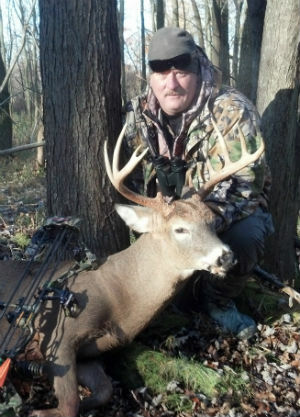 Bob Yax and Thor from Deer Search with Mike's buck. Mike's 3.5 year old 10-point green scored 124"
A big thanks to Bob Yax and Thor, even though it ended up being an easy track. Even after twenty-five plus years of hunting I learned a lot from Bob about wounded deer and couldn't be more happy. I highly recommend calling Deer Search if you find yourself in the same predicament. What had looked like a nearly perfect shot and blood trail turned into a worrisome, but ultimately successful adventure.